The final (and best!) 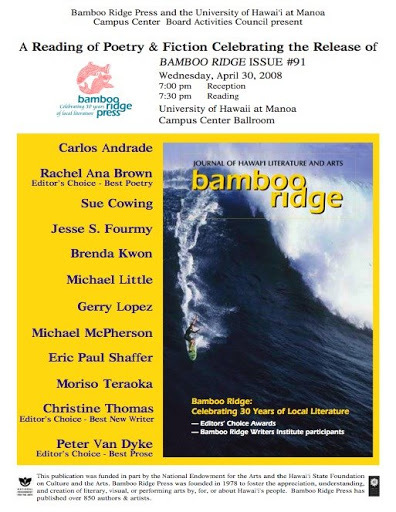 April event is the launch of Bamboo Ridge issue #91 on April 30 @ 7pm at the UH Manoa Campus Center Ballroom. Twelve featured authors, listed at right, include Peter Van Dyke, who won the editor’s choice award for Best Prose; Christine Thomas (yes, that’s me), awarded editor’s choice for Best New Writer; and Rachel Ana Brown, the choice for Best Poetry. It’s the 30th year of Bamboo Ridge’s service to local writers and stories, and this reading is free and open to the public. So come down! If for some odd reason you miss it, check out the second reading and reception at Native Books/ Na Mea Hawaii May 9 at 6.30 p.m. I’ll remind you, too.